Many people find it hard to develop new friendships or keep up existing friendships. 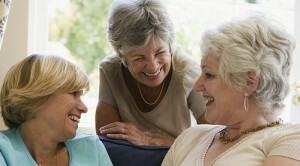 Friendships often take a back seat to other priorities, such as work or caring for children or aging parents. Maybe you find yourself in a new community without friends. Developing and maintaining good friendships takes effort. The enjoyment and comfort friendship can provide, however, makes the investment worthwhile. According to the Mayo Clinic, friendships have a major impact on your health and well-being. Friends outside of your family group help you celebrate good times and provide support during bad times. Friendships prevent loneliness, isolation, and depression, and give women the opportunity to offer help to others. Because friendship is so critical to the women in our community, the Alachua Woman’s Club strives to be the place for women to meet and build lasting friendships. Women build these relationships by working on Community Projects together and by presenting and participating in Educational Seminars and Workshops designed with women in mind. Projects include the Food4Kids Program, the Annual College Scholarship Program, and the Toys for Kids Program each holiday season. Workshops include Finance, Investing, Health, Small Business, a Mentoring Program for Young Women, and other topics as requested by Members. The Club provides an opportunity for women to learn the art and science of event planning and coordination by providing events to the community for fund raising or simple camaraderie. Here is what Friendship does for you: Increases your sense of belonging and purpose, boosts, your happiness, reduces stress, improves your self-worth, helps you cope with trauma, such as divorce, serious illness, job loss or the death of a loved one, and encourages you to change or avoid unhealthy lifestyle habits, such as excessive drinking or lack of exercise. THE MEDICATION WE PROVIDE TO WOMEN: LAUGHTER! It’s very rare to find a group of women who are not laughing. When it comes to relieving stress, more giggles and guffaws are just what the doctor ordered. Here is why: laughing does you good. Laughter is a great form of stress relief, and that is no joke! A good sense of humor cannot cure all ailments, but data are mounting about the positive things laughter can do. There is no need for a specific number of friends. Some people benefit from a large and diverse network of friends, while others prefer a smaller circle of friends and acquaintances. There are also different types of friendship. You may have a few close friends you turn to for deeply personal conversations, and more casual friends with whom you see movies, play golf or share backyard cookouts. Consider what works for you. Overall, the quality of your relationships is more important than the number of friends you have. This entry was posted in Announcements on November 1, 2015 by admin.